It’s a chilly, but beautiful day on the farm. Spent the morning doing a lot of outside chores. Now I have to get ready to take Farmboy to gymnastics, then I have choir practice. 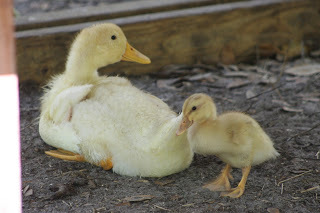 So, I give you cute duckling pictures. Remember my little baby ducklings? Well, they’re teenagers now. They’re so pretty now that they’re starting to feather out. I know I have at least one female (only females quack). I’ll keep one drake and the rest of the drakes will go to freezer camp. 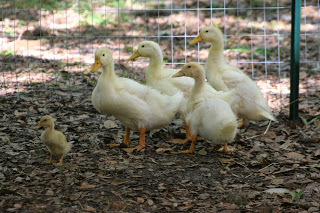 The little duckling is a Saxony mix who hatched March 9. He’s supposed to be in the coop, but escaped when I let the big kids out this morning. Of course, I can’t catch him, so he’s spending the day outside. He’s so cute. Too bad he runs when I get within 10 ft of him. The turkeys have learned how to fly out of their enclosure. I need to clip their wings, but keep putting it off. At least they stay close to their run and are easy to catch when I put them up at night.